The image is a painting dated 1817 by an unknown artist. It shows view of Geneva’s Plaine de Plainpalais with cricket’s players. 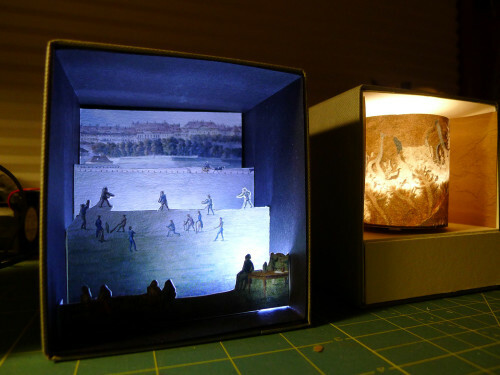 The format of the box is a simple diorama or sometimes known as perspective box. I separated the image into 4 pictorial planes digitally. These are cut out and installed evenly in the depth of the box. 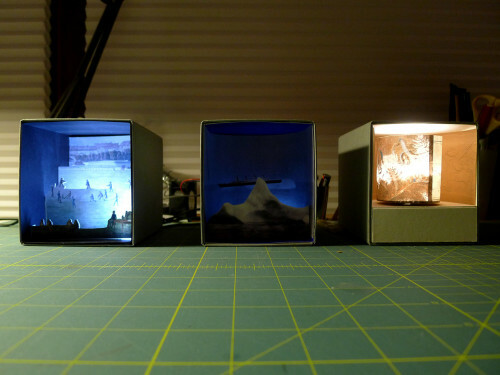 Three diffused 10mm white LEDs are used to light the different layers of the image. The foreground and background are two photographs of the icebergs that were suspected to have been responsible for the sinking of the Titanic. The background image is of an iceberg floating near the site of the disaster. The author of the image is unknown and is kept with the U.S. National Archives and Records Administration. The foreground image was taken bythe chief steward of the liner Prinz Adalbert. It is titled ‘How Large Was The Iceberg That Sank The Titanic’ archived at the Navigation Center, United States Coast Guard. 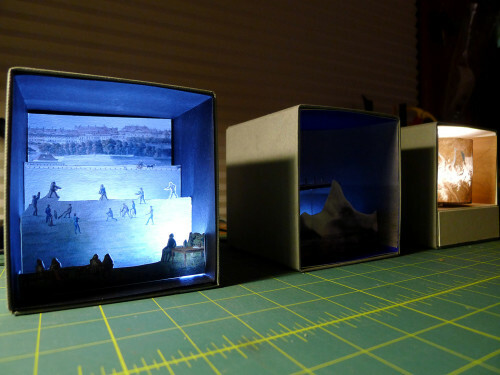 The format of this box began with the idea of a portable moving panorama, popular in from the late 17th to early 19th centuries. 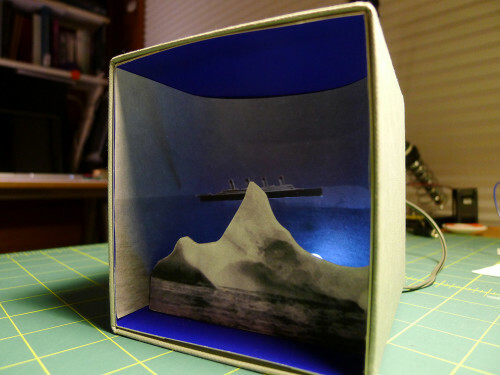 This box, however, only consists of a single rotating view rather than a scrolling painting controlled by two winders. 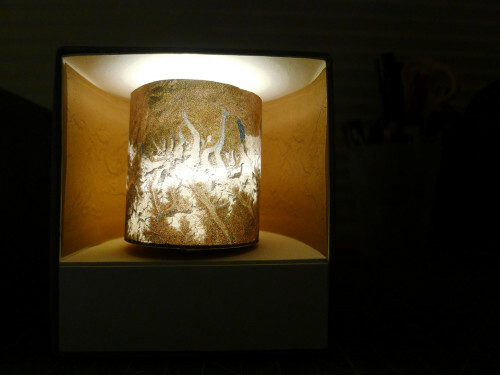 The rotating drum is lit from the inside with a superbright (24,000mcd) warm white LED. Two images compose the drum: German cartographer, Otto Krummel’s map of the Mariana Trench from 1907, and an image taken by ASTER (Advanced Spaceborne Thermal Emission and Reflection Radiometer) instrument aboard NASA’s Terra satellite. Krummel’s map is believed to the first standalone map of the Mariana Trench, discovered in 1875. NASA’s photograph shows glacier lakes in the Bhutan-Himalaya. It shows ‘glaciers in the Himalaya are wasting at alarming and accelerating rates, as indicated by comparisons of satellite and historic data’. The background image is created by NASA/Goddard Space Flight Center Scientific Visualization Studio. It shows the Earth drained of water. In the animation, where this image originated from, the Mariana Trench is the very last to be drained out of water.